In elementary school, when we sang "This Land is Your Land" and the teacher told us about Woody Guthrie, it seemed like Guthrie must've been around before the USA was founded. He must've been a contemporary of ... of Paul Bunyan's. But to my great surprise, it turns out Guthrie had just died when I was 3 years old — and when he was only 55. I won't tell the whole story of how Guthrie came to hold such a mythical status so quickly — but if I were to tell it, it would mostly be a story about Pete Seeger. Seeger made building the Woody Guthrie myth into one of his major projects. The more you know about Pete Seeger, the more you realize he wasn't just "famous" or "influential," he really helped engineer what "folk music" means, and even the terms on which "the folk" themselves exist. Anyway, here's the point. His book, "How to Play the 5-String Banjo" has been known to virtually every banjo player in the world for about half a century. 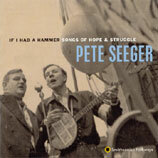 Seeger mimeographed the first edition himself while on the road in 1947, working for the Henry Wallace presidential campaign. He refused to copyright it, believing a copyright would hinder the spread of banjo-playing. More recently, a guy named Pat Costello has written some excellent and entertaining instruction books, and declared them part of the "creative commons." According to Costello, sales of his books increased spectacularly after the books went copyrightless. The books are worthy successors to Seeger's landmark book — and I think the writer of "This Land is Your Land" would have appreciated them as well. A collection of fine star charts has also now gone online (here too) as part of the creative commons.